All this theory is very good, but where is the proof in the pudding? I have just finished installing an Ironbark deck under a new pergola at my home. The deck was finished 2 weeks ago (3rd April), and my plan is to allow it to weather for 6-8 weeks before applying it’s first coat of Aussie Clear. 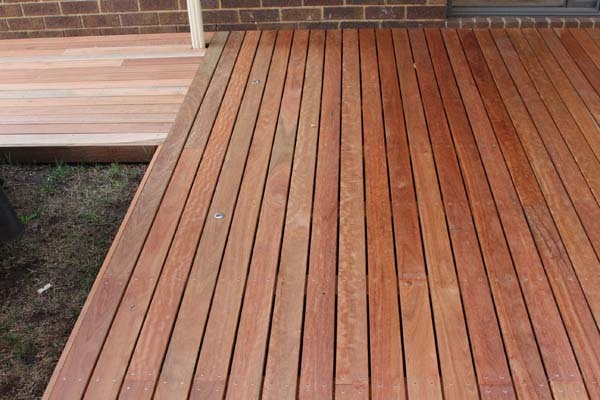 This is especially important for waxy timbers like Merbau or very dense and hard timbers like this Ironbark deck. The extractives bleed is what I’m going to focus on in this first post. This deck is partly exposed to the weather as it is under a pergola. The exposed sections saw over 40mm of rain in the first week of instillation over 4 or so days. In the first photo, you see the timber extractives were drawn to the moisture at the edges of where the weather got in. 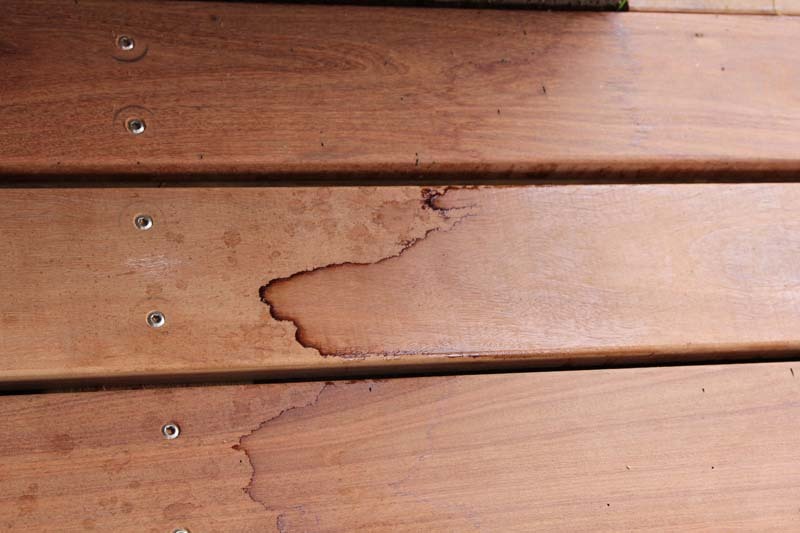 Above: you can see the timber extractives that were drawn to the moisture after rain in this Ironbark decking. The next photo shows a clear difference that 40mm of rain had on the timber that received it. The outer exposed edges are a distinctly lighter colour with the extractives beginning to fade. This is perfect for those outer edges, but no so much for the sheltered decking. So what I have done is simply hose down the deck where it’s not likely to get much weathering. Above: Note the more exposed section on the left half of the photo is lighter than the right half. The roof line of the pergola is on the outer edge of the main deck, so the path at the top left of the photo is completely uncovered while the left side of the main deck is partially exposed. So the plan over the remaining 4-6 weeks is to frequently hose the deck down to bleed those extractives before oiling it. The next update will be of the deck just prior to it being oiled and of it being oiled. As always, this method may not be best if the timber is installed in the middle of a heatwave. In that case Preschem recommends putting a single coat of Aussie Clear down to prevent splitting, checking and cupping. Note though, that this first application will not last the usual 9-12 months for the reasons stated above. Otherwise, it is perfectly safe to allow the timber to weather for 6-8 weeks as you shall soon see. Stay tuned for the followup post.